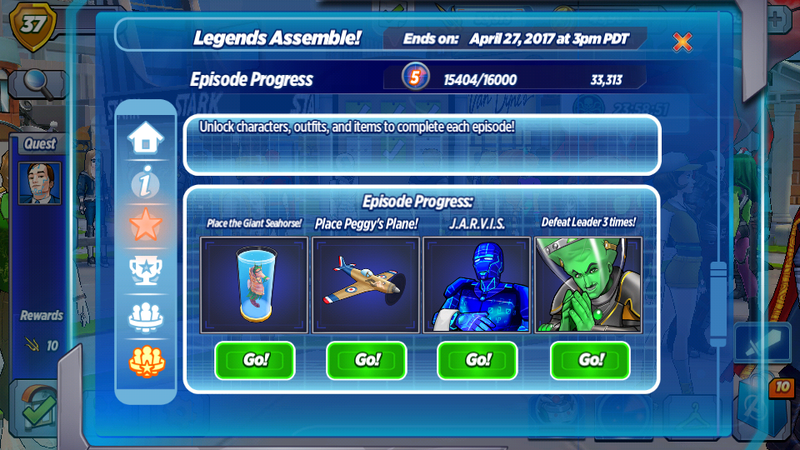 Episode 3 of the Legends Assemble! 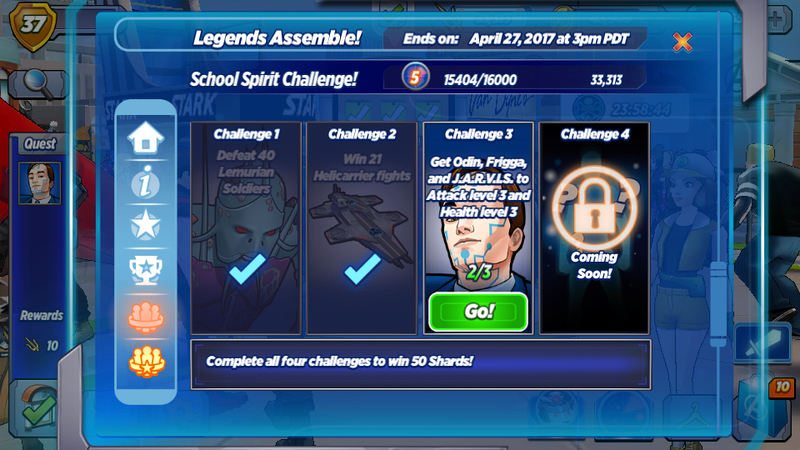 Special Event is now live in our games! Once you have completed the quest "Supreme Revenge", you will be able to start episode 3! Complete all quests marked with a gold star to advance. 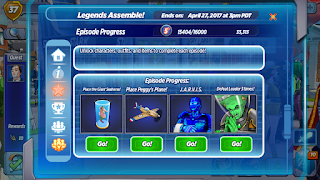 Episode 3 of the Legends Assemble! 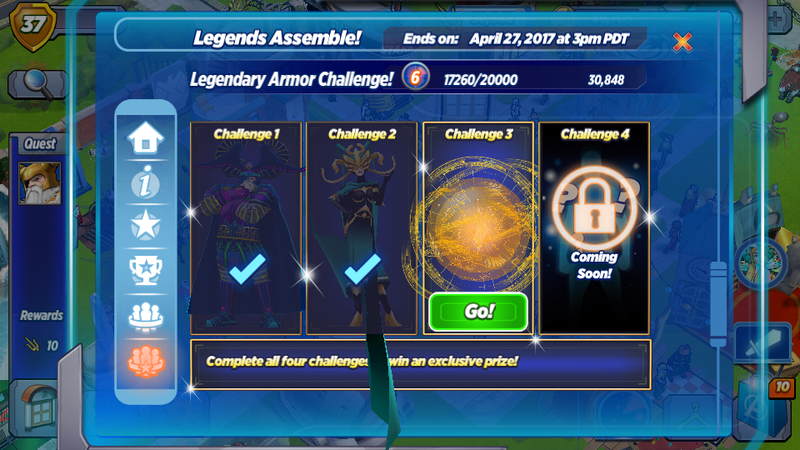 Special Event ends on April 20th at 3 pm PDT/6 pm EDT. You must unlock A.I. J.A.R.V.I.S. 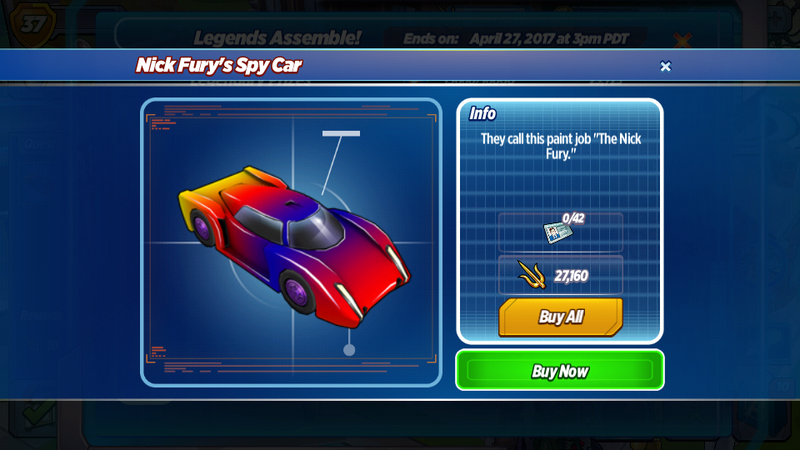 and Nick Fury's Spy Car by the end of the episode or they will no longer be available at that time. 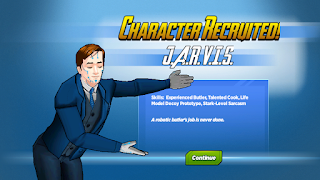 How do I recruit J.A.R.V.I.S.? 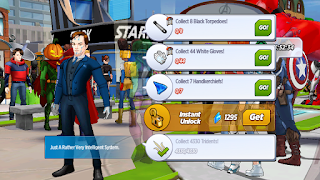 Once you turn in these items, J.A.R.V.I.S. will join the Academy. He must be completely unlocked by the end of the event or he will disappear from the game at that time. 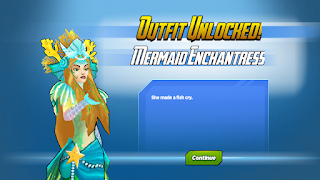 How do I unlock Mermaid Enchantress? 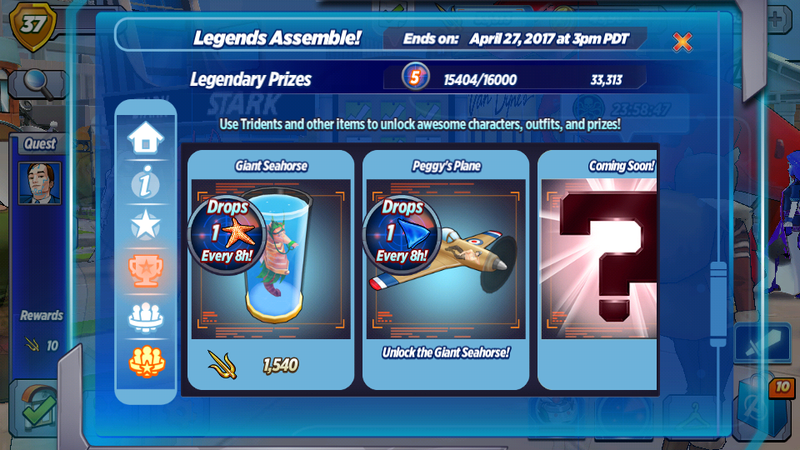 How do I unlock Peggy Carter? 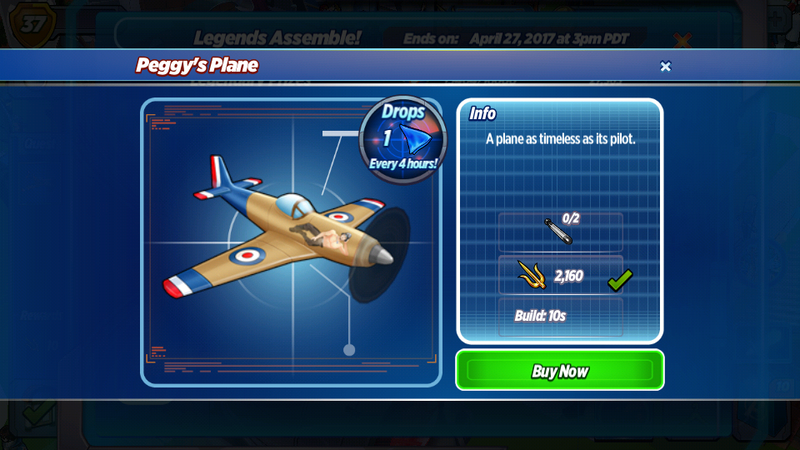 Peggy Carter is available to recruit for 295 Shards! 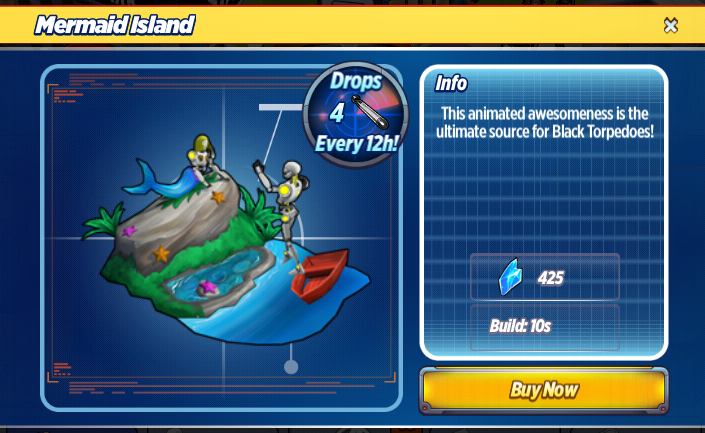 You can recruit her from the Shop. 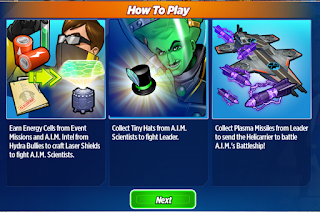 How do I unlock M.O.D.O.K.? M.O.D.O.K. is available to recruit for 650 Shards! You can recruit him from the Shop. M.O.D.O.K. 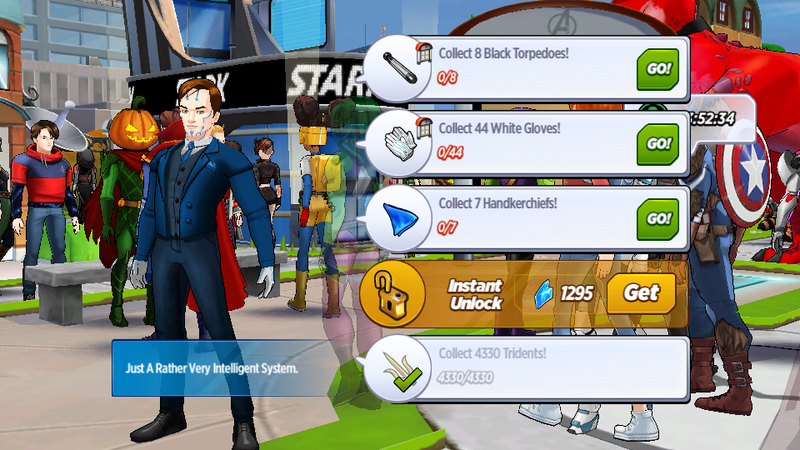 increases the drop rate of White Gloves for unlocking J.A.R.V.I.S. 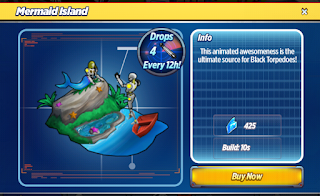 and will increase the drop rate of items needed to unlock Leader in Episode 4. He must be completely unlocked by the end of the event or he will disappear from the game at that time. 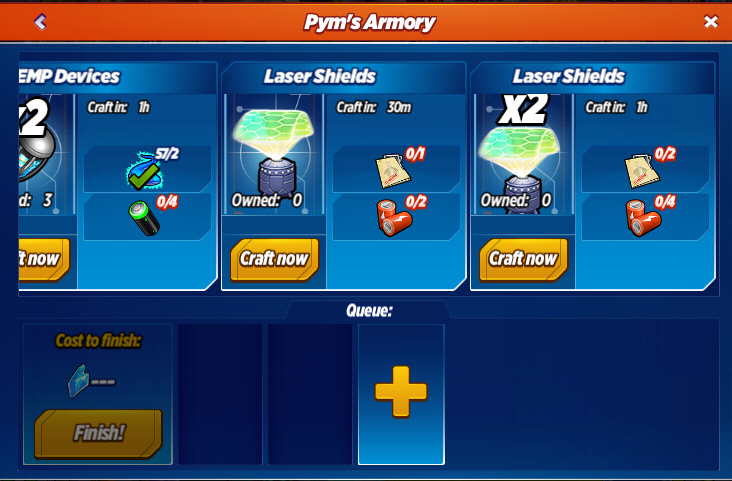 How do I craft Laser Shields? Start the quest "Take A.I.M.!" to begin crafting Laser Shields! 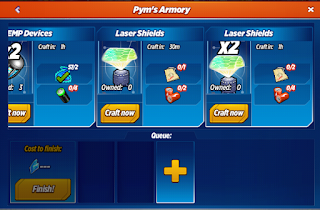 Laser Shields can be crafted at Pym's Armory. They require A.I.M. Intel from defeating Hydra Bullies and Energy Cells from the Mission Board to craft. How do I fight A.I.M. Scientists? 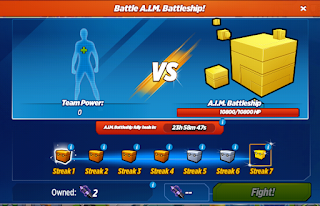 Fight A.I.M. Scientists by tapping on them from the event playspace! Use Laser Shields from the Armory to take them on. 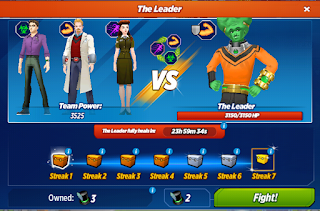 How do I fight Leader? Start the quest "Defeat Leader!" 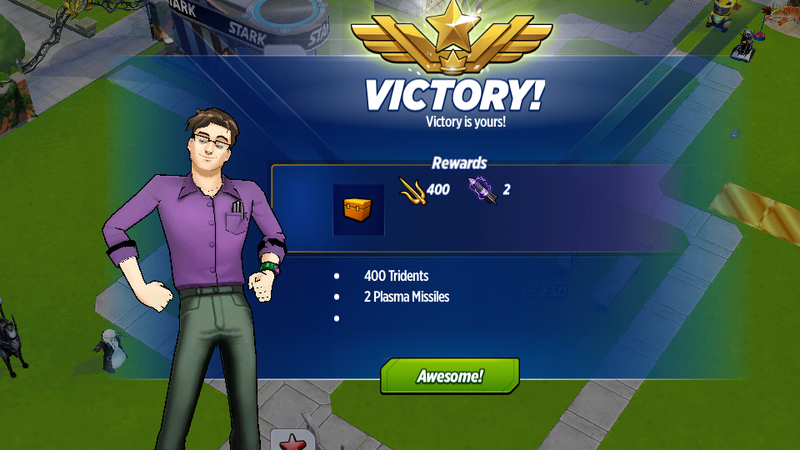 by completing "A.I.M. High!" to begin fighting Leader. You will need Tiny Hats from defeating A.I.M. 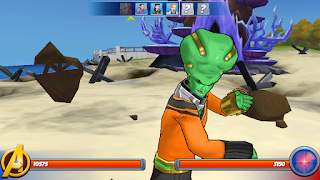 Scientists to fight him. 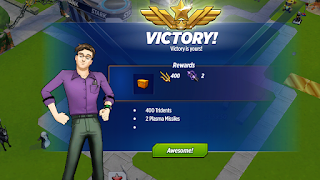 Defeating Leader grants you Tridents, Plasma Missiles to fuel Helicarrier battles against the A.I.M. Battleship, and Antivirus Programs for A.I. J.A.R.V.I.S.! 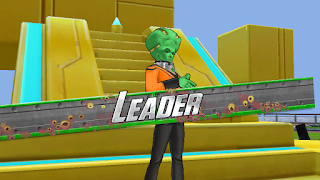 Leader is the Strength type of combatant. How do I train Speed Type Heroes? 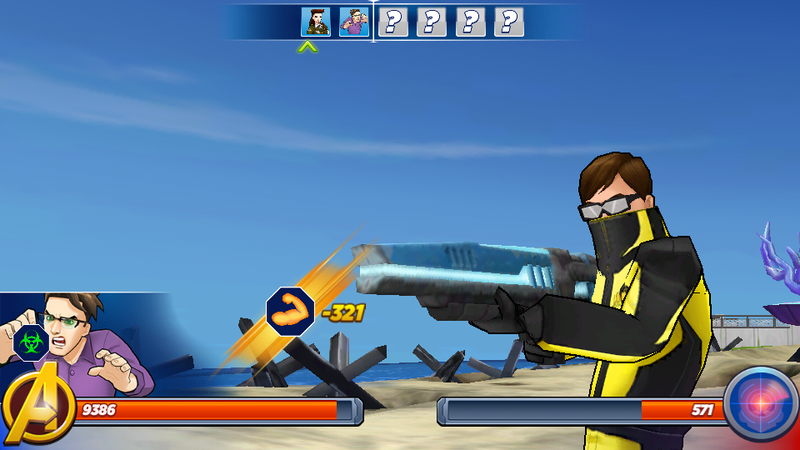 Access the combat skills menu to train Enchantress and J.A.R.V.I.S. at the Dance Battle Station on the event playspace! Agent Peggy Carter trains at the Crab-Eating Station. How do I fight the A.I.M. Battleship? 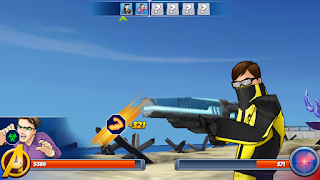 Start the quest "Futurist Fight" by completing the quest "Defeat Leader!" to fight the A.I.M. 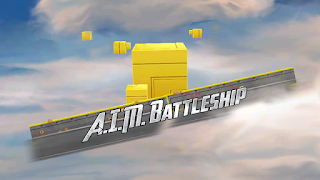 Battleship! 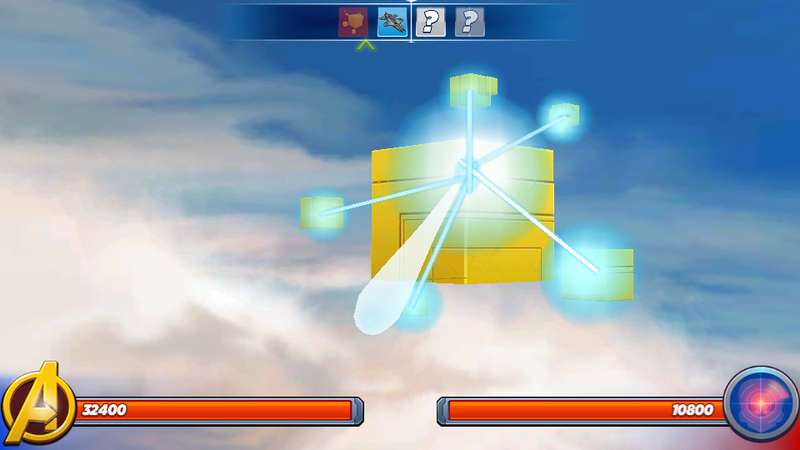 Earn Plasma Missiles from defeating the Leader to send the Helicarrier into combat versus the A.I.M. Battleship. Fights against the A.I.M. Battleship will earn Black Torpedoes for recruiting J.A.R.V.I.S. and Pilot Licenses for Nick Fury's Spy Car! 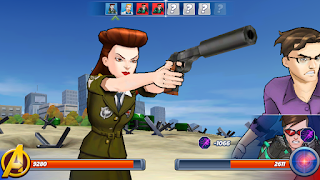 How do I unlock Agent Peggy Carter? Agent Peggy Carter is available for 345 Shards in Van Dyne's Outfits! This outfit allows her to craft items to fight any boss, minion, or battleship for the event. It also enables her to participate in battle! Agent Peggy Carter trains her combat skills at the Crab-Eating Station. How do I unlock A.I. J.A.R.V.I.S.? A.I. J.A.R.V.I.S. increases J.A.R.V.I.S. 's combat stats and allows Torpedoes to drop from the Mission Board. 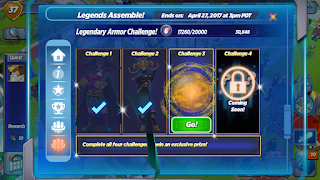 NOTE: This outfit is only available during Episode 3 and will no longer be available once Episode 3 ends on April 20th at 3 pm PDT/6 pm EDT. Enchantress: I realize we haven't always been on the best of terms, but I'd like you to craft me a new outfit. Wasp: You said my clothes only belonged on homeless dung beetles. Enchantress: My Asgardian sense of humor doesn't always translate. The truth is that your wares are...generally satisfactory. Enchantress: You see, we're getting along better already. Mermaid Enchantress: I take back almost every terrible thing I said about you. The outfit is absolutely stunning. 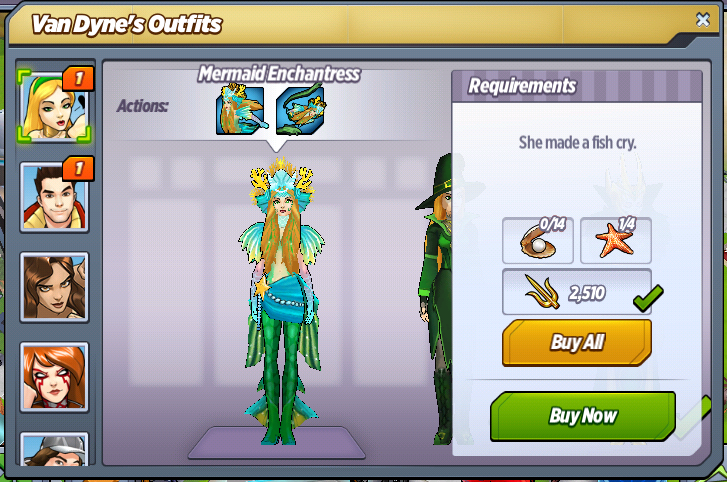 Wasp: You're lucky I've always wanted to make a mermaid outfit. And that Pepper talked me out of lining the inside with itching powder. Mermaid Enchantress: Well, it's wonderful. I'll be irresistible to these filthy Lemurians. Wasp: What are you planning? 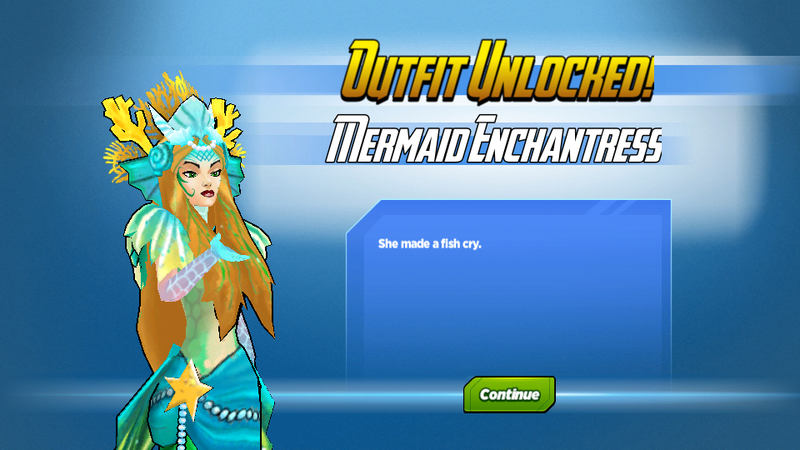 Mermaid Enchantress: I couldn't help but notice that your leader Attuma has been defeated and imprisoned. 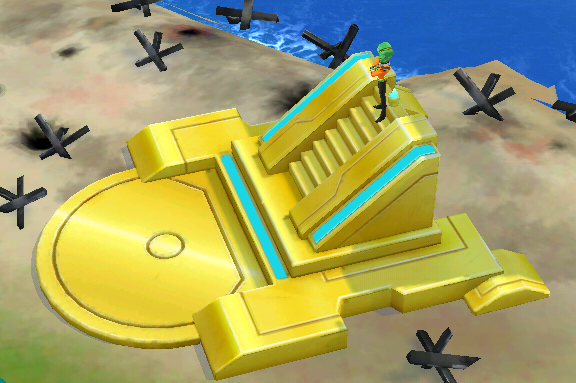 I believe I'm capable of leading the Lemurians and the Undersea University into a new age of prosperity. Lemurian: Where are you from? Mermaid Enchantress: The Midgardian ocean. Mermaid Enchantress: Where do you keep your undersea treasure? Lemurian: I have a whole closet full of sunglasses! Lemurian: Humans drop their shades in the water all the time! Sometimes I like to pretend I'm Lemurian Blade! "Let's dust some subaquatic suckheads." 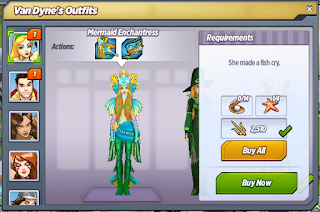 Mermaid Enchantress: Your followers are idiots. Attuma: You think I don't know? It's pretty limiting when all of your potential recruits have to be able to breathe underwater. My second best student is an abalone. Mermaid Enchantress: If you tell me where your treasure is held, I'll free you from this cell. Attuma: And if I don't? Mermaid Enchantress: You will continue to rot away in prison, and I will continue to be fabulous. J.A.R.V.I.S. : It's good to see you, sir. However peculiar the circumstances. Iron Man: How? Who? What? J.A.R.V.I.S. : Where and why. I only had to teach the five W's one time. Even as a child, you were masterful at information gathering and problem solving. J.A.R.V.I.S. : The prototype for what you know as a Life Model Decoy. Your father built it to ensure that you would be taken care of should anything happen to your parents, and the butler formerly known as Jarvis. Iron Man: Who activated you? J.A.R.V.I.S. : I'm honestly not certain, sir. I awoke in the strange fog surrounding this campus, and immediately made my way toward you. I'm an Englishman, so it will take more than a bit of fog to keep me from my duties. J.A.R.V.I.S. : Sir, would you like me to continue running diagnostics on the Hulkbuster prototype? Iron Man: Wait, so you're that J.A.R.V.I.S. too? You're my computer system? J.A.R.V.I.S. : I wirelessly downloaded the entire system into my neural networks upon arrival. I assumed you wouldn't mind since you chose to name the system after me. Thank you for the honor, by the way. J.A.R.V.I.S. : When you work for the Starks, you quickly become accustomed to weirdness. 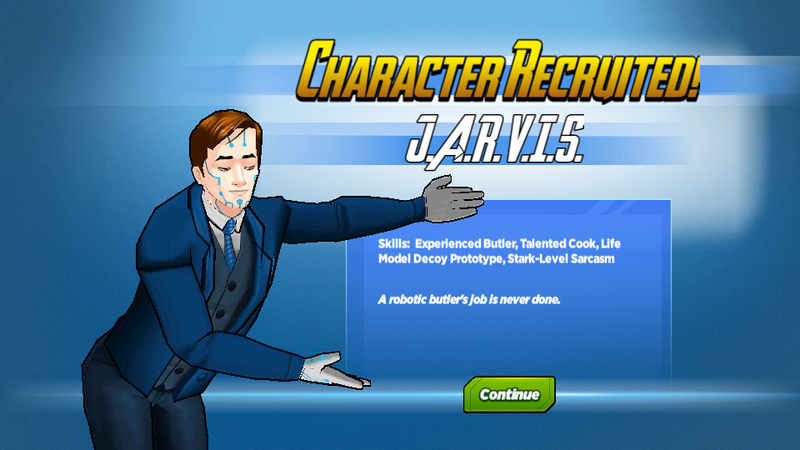 Wasp: Jarvis! You're totally sort of real! J.A.R.V.I.S. : It's a pleasure to finally meet you, Miss van Dyne. You have diligently protected young Mr. Stark in my absence, and for that, I am eternally grateful. Wasp: I'd do anything for Tony! J.A.R.V.I.S. : Will you help me eradicate his enemies to assure he'll never be threatened again? Wasp: I'll eradicate everything for no good reason! Pepper Potts: Welcome to Avengers Academy, Jarvis! Is there anything I can do for you? J.A.R.V.I.S. : Profess your love for young Mr. Stark. J.A.R.V.I.S. : Only if you believe you love him, as I believe he loves you. J.A.R.V.I.S. : If there is one thing I learned from the elder Mr. Stark, it is that thousands of accomplishments can fall victim to a single regret. Scientist Supreme: A.I.M. has upgraded its tech, and expanded its forces. You chose a bad time to be a traitor, you pathetic lump of living loneliness. 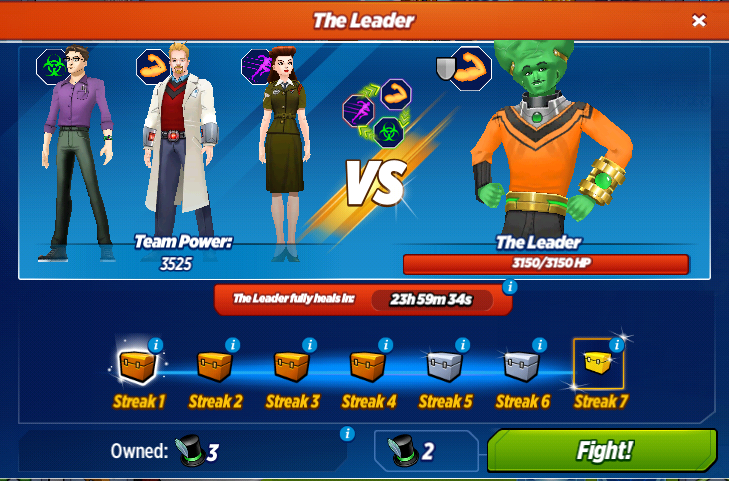 Scientist Supreme: Explain how you allowed yourself to be defeated by the Avengers! A.I.M. Scientist: I mean, they're the Avengers, man. They're ridiculously strong. I'm just a socially awkward guy with a yellow uniform. By the way, have you ever considered changing our colors to purple? A.I.M. Scientist: Do you think we'll win? A.I.M. Engineer: You're kidding, right? First of all, this isn't a war, it's a henchmen beatdown procession. The biggest victory we can hope for is not getting stepped on by Hulk. A.I.M. Scientist: Why fight for A.I.M. if you don't think we can win? A.I.M. Engineer: I need to those sweet benefits to manage my irritable bowel syndrome. A.I.M. Scientist: I'm thinking about switching schools? Do you think I'd fit in at Undersea University? Lemurian: Can you breathe underwater? A.I.M. Scientist: I can hold my breath for a really long time. Lemurian: I'm not sure you're a good fit, but I could talk to my cousin at Attilan Academy. Do you have any powers? Loki: Your forces are being smacked around like the nerds they are, SkinTight SourCream. Loki: They said I couldn't call a man Mashed Potatoes, and I proved them all wrong. You continue being a bucket head punching bag, I'll continue to be the master of mirthful monikers. 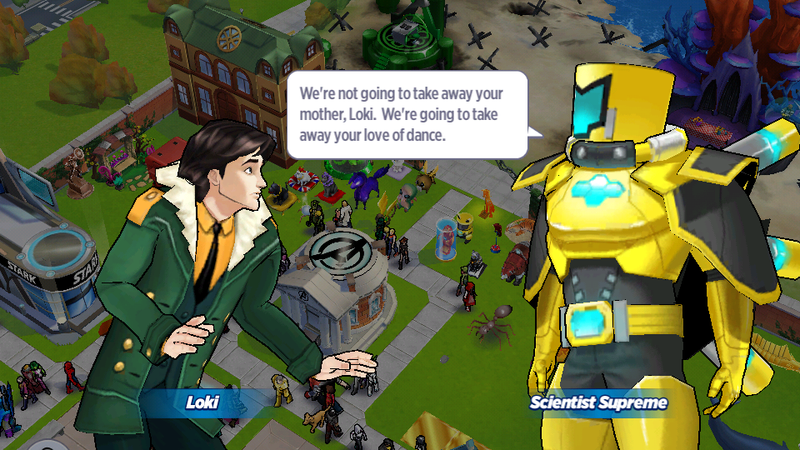 Scientist Supreme: We're not going to take away your mother, Loki. We're going to take away your love of dance. Loki: Tell your leader that Loki will never stop dancing! A.I.M. Scientist: I'd rather send him an email. You have to make an appointment to talk to him in person, and then he throws energy drinks at you while you're trying to talk. The Leader: I don't take orders from you, you blockheaded buffoon. I agreed to join your quasi-intellectual organization to get my piece of the cosmic treasure. You're simply a tool to achieve my goal. Scientist Supreme: You're a tool! The Leader: You're a tool! M.O.D.O.K. 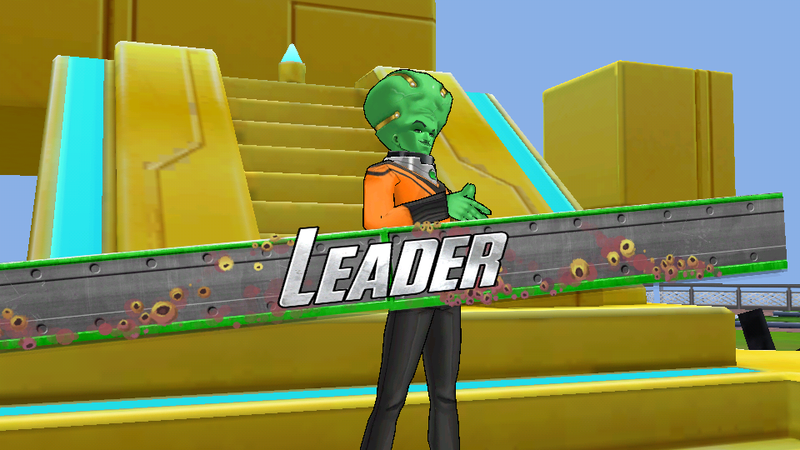 : You chose the wrong side, Leader. M.O.D.O.K. and his friends will defeat A.I.M. once and for all. The Leader: First of all, I'm on my own side. I hate A.I.M. more than you do. Second of all, I've just begun to fight. I wanted to evaluate your strengths before unveiling my greatest inventions. M.O.D.O.K. : What is your greatest invention? Scientist Supreme: It's nice to know someone appreciates a mix of futurist style and unparalleled technology. A.I.M. Engineer: I know. I was thinking about just hiding in the bushes until it's over, but they're all taken by Hydra guys. A.I.M. Scientist: They're super good at retreating. The Leader: You changed back?! Bruce Banner Hulk: I always changed back and forth, I just found a way to control the transformation. The Leader: That's not fair. My entire life revolves around being your arch-nemesis. You're the hulkling brutish green hero, I'm the smallish brilliant green villain. Bruce Banner Hulk: We can both be heroes. The Leader: But all of my inventions are designed for villainy. Even my furniture screams superhuman scoundrel. I'm pretty much all in on evil at this point. Scientist Supreme: Your combat is as laughable as your intellect. The Leader: This is simply a temporary setback. Scientist Supreme: It better be. The Leader: No matter what happens in my fight with the Avengers, I'm going to shatter that helemt into a thousand pieces, and make you eat every bit. Scientist Supreme: Little do you know that my armor is designed for maximum deliciousness. Loki: Your fate is sealed, Pepper. My family will see you dead for endangering my mother. Loki: SHE'S THE MOST WONDERFUL PERSON EVER! The Leader: What made you think it was a good idea to kidnap the matriarch of a family of immortal maniacs? Scientist Supreme: I'm the Scientist Supreme. The greatest super-scientist on a planet filled with super-genius super-scientists. I never ask why. I only ask how. The Leader: That is literally the dumbest thing I've heard. And I've had a lot of conversations with various Hulks. 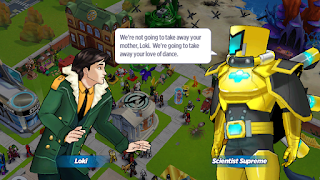 Odin: I'm going to offer you one opportunity to abandon your villainous ways, and join Avengers Academy. The Leader: What if I refuse? The Leader: I'm gonna give it one more shot, and if things don't go my way, I will give strong consideration to your generous offer. 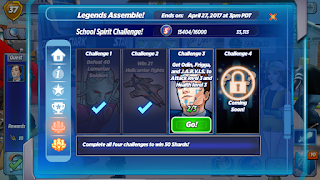 The Leader: Can I still join Avengers Academy? Please? Odin: Are you prepared to trade your life of villainy for one of heroism? Odin: Use them on villains. We nearly kill villains all the time. Scientist Supreme: Enough of this foolishness. It's time I finished you myself. J.A.R.V.I.S. : Excellent timing, sir. The young Mr. Stark has just begun construction on your prison cell. Scientist Supreme: Then he can be my first victim. J.A.R.V.I.S. : I wouldn't suggest that course of action, sir. If you attempt to harm young Mr. Stark, I will have no choice but to forcibly remove your organs. M.O.D.O.K. : Help M.O.D.O.K. imprison Scientist Supreme. The Leader: What's in it for me? M.O.D.O.K. : So many things! We can be teammates! We can be friends! We can watch Scientist Supreme suffer in silence for all eternity! M.O.D.O.K. : Leader will be the leader! M.O.D.O.K. will be the friendly henchman! Loki: What is that slimy beast? 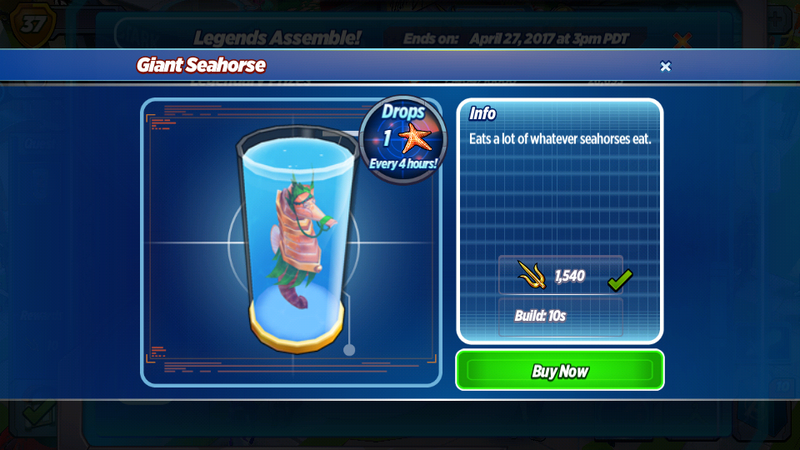 Wasp: A super cute seahorse! Loki: I was talking about Enchantress. Wasp: That never gets old! Lemurian: You asked for a horse. Seahorses are the horses of the sea. Hence the name. Mermaid Enchantress: What does it eat? J.A.R.V.I.S. : Miss Carter, I thought you'd like to know that I located your plane within the timefog. 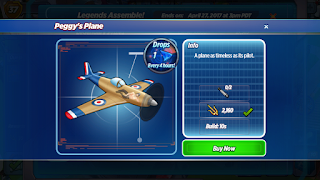 Peggy Carter: My P51 Mustang?! J.A.R.V.I.S. : I took the liberty of extracting it from the timefog, and making some modifications. It now features emergency magnetoplasma rockets, and will respond to your voice commands. J.A.R.V.I.S. : If the butler formerly known as Jarvis' memory serves correctly, it is I who owes you. Peggy Carter: Do you fly? Captain Marvel: You could say that. Nick Fury: This is old school. It's constructed from clear fiberglass down to the engine, making it invisible in normal circumstances. It's also outfitted with a color-changing rheostat that makes it change color by remote. 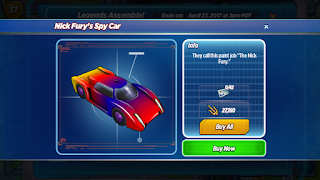 Black Widow: What kind of spy mission requires a rainbow-colored car? 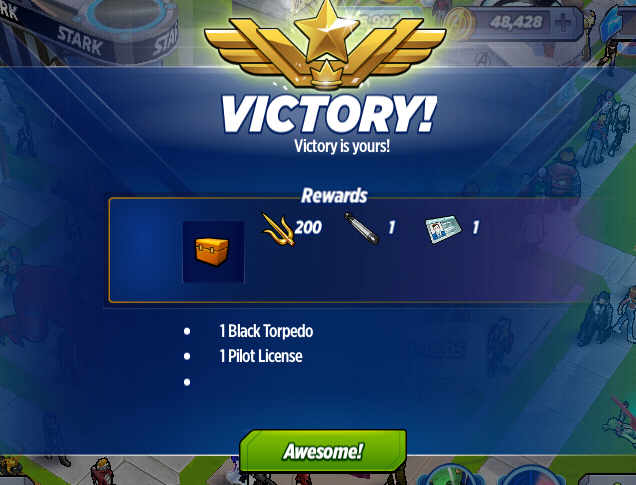 Get the Helicarrier to level 8 Attack! Get the Helicarrier to level 8 Health! What do you think of Episode 3 so far? 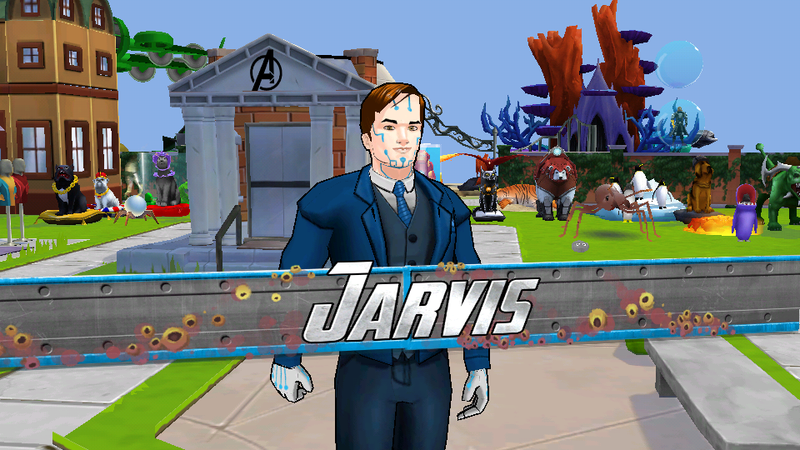 Excited to unlock J.A.R.V.I.S. ?